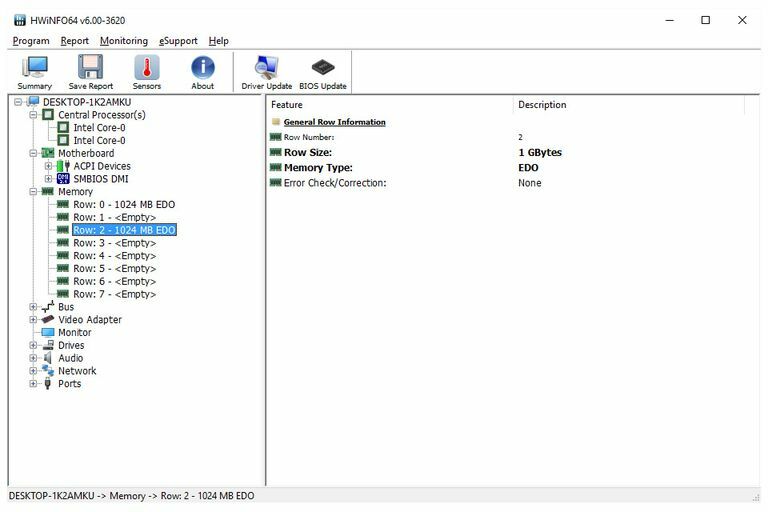 HWiNFO is a free system information tool for Windows that gives a quick overview, as well as a detailed look, at hardware components. You can save full or custom reports, use HWiNFO on a portable device, and monitor various hardware pieces in real-time. This review is of HWiNFO version 6.04, which was released on April 3, 2019. Please let me know if there's a newer version I need to review. While some system information tools also gather software information, HWiNFO focuses on hardware alone. It does so by categorizing all the information it gathers into ten sections: CPU, motherboard, memory, bus, video adapter, monitor, drives, audio, network, and ports. HWiNFO works with Windows 10, Windows 8, Windows 7, Windows Vista, and Windows XP. Both 32-bit and 64-bit versions are available. Download the 64-bit version of HWiNFO only if you're running a 64-bit version of Windows. See Am I Running a 32-bit or 64-bit Version of Windows? to learn more. See the What HWiNFO Identifies section at the bottom of this review for all the details on the hardware and operating system information you can expect to learn about your computer using HWiNFO. There's much to like about this comprehensive tool. HWiNFO reminds me of the system information tool Speccy, but combined with something a bit more detailed like SIW. What I mean by this is that while it's super easy to use and navigate around in, it's also pretty detailed. Most of the system information tools I've used included network information like the subnet mask and IP address. Unfortunately, HWiNFO simply shows the MAC address. This is a bit surprising considering the tons of detail it goes into with other sections. I tried both the installable and portable version of HWiNFO and they both seemed identical. There were no slow performance or hiccups in the portable edition. I also like that the portable version is so small - it produces two files, that together are less than 5 MB, which is perfect for something like a flash drive. Floppy, internal, external, and disc drive information, like model numbers, serial numbers, capacities, drive geometry, transfer modes, and features; disc drive information details the type of discs they can read and write to, like CD-R, DVD+R, etc.